Because philosophers run the world (well, often a generation after they pass away). Christian teens need to understand the philosophies that have driven world culture and politics since ancient times. This prepares them to help create new philosophic ideas that can change the world! covers some important movements in church history, so that teens can note the impact of the faith on the world of philosophers. 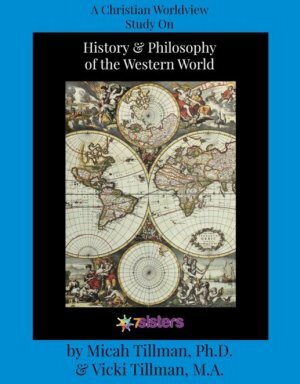 History and Philosophy of the Western World is a 1 credit etext (downloadable pdf) written in a friendly, conversational style that helps homeschoolers discover the ways that philosophers have impacted their world since before the ancient Greeks – and the ways the world has impacted the philosophers. It adds a fresh history approach to a lively homeschool transcript! Written by 7 Sister Vicki Tillman and her oldest son, Dr. Micah Tillman (philosophy instructor at Mt. Saint Mary’s University and McDaniel College), History and Philosophy of the Western World has been used as textbook for local homeschool classes for years. This fun and thought-provoking World History high school curriculum may be completed by a homeschooling high schooler with or without parental support. It also works well with homeschool group classes. Help your homeschooler earn transcript credit with this useful and fun World History high school curriculum – integrate History and Philosophy and get ready to change the world! Click here To view an excerpt from History and Philosophy of the Western World. “This fall my daughter utilized the Chronicles of Narnia for the first semester as well as the World History and Philosophy. Both courses provided questions that went beyond “give me the details of the story” and required her to think. She needed to provide supporting material for her answers. In addition, these courses have improved her writing and knowledge of the bible.” – Jeanette S.